Being Human is hard. Carpel Tunnel, Tendinitis, Rotator cuff injuries, Epicondylitis (elbow), Trigger finger, Muscle strains and low back injuries are just a few of the Musculoskeletal Disorders (MSDs). Sounds fun right? Not so much. But, these are the kinds of health-related injuries that humans can undergo in today’s working environment. I would wager that you don’t want to imagine your retirement (or your team’s) as having to wear a back brace, having knee-replacement or having wrist surgery because of all of those hours sitting in a plastic chair typing, not to mention being overweight from all of that sedentary activity. Perhaps you are dreaming about a retirement centered around traveling, golf, or that beach house on the shore? It is likely you will not be able to enjoy any of those if you are constantly abusing your body now. The average person who works eight hours a day, for thirty years will have worked over 60,000 hours! To say it doesn’t matter how you sit, type, stand or whatever you do while working would simply be negligible. It’s like saying that a football player does not have to worry about the head-related injuries after playing for ten years hitting other people with their heads fifty times a game for 10 years. Conversely, it would be like saying a professional soccer player is out of shape. Our working environment has an immediate impact on our health and well-being. It forms our physical well-being in some way or another. Work is also what puts food on the table, a roof over our heads and fills our highest need of self-efficacy and purpose. Humans cannot avoid work and thus it’s vital that it is a place where they don’t have to suffer long-term health effects, but rather maintains or even enhances our well-being. While all of this is true and most people would agree so far, why do people not take care of their bodies while working? Why does it go to the back-burner? Most of the time, it is a matter of productivity or creativity. But, if one was to really look into it, they would find that it wasn’t so hard after all to make working a less hazardous occasion. Now that we understand the risks and a glimpse of how much work means to our livelihood, we can move on to solutions – MSD’s are not a casualty of war that we have to undergo. There is a whole area of science dedicated to helping fit jobs to people so that you can walk away from work being the person you were born to be (and be more productive), not somebody formed by their trade. Ergonomics is the process of fitting jobs to people so that they can at the very least reduce the likelihood of these conditions and lead more productive lives. If you agree with what’s been said so far, but don’t know how you can implement it, read on. Ergonomics is sometimes hard to describe and convince senior leadership on if you don’t understand the benefits. But, don’t let that get in the way of doing what’s necessary to make your working space an Ergo-friendly environment. Start by doing your research on the WIIFM factor (What’s In It For Me) for Senior Leadership. 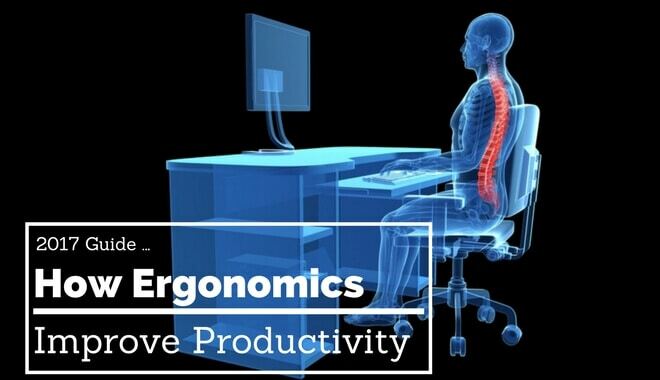 How will ergonomics help the business? You can answer that question by citing this page where one can see that there can be definite cost advantages to more efficient and more human-friendly processes. Not to mention, it has been shown that that Ergo-friendly working places also have less absenteeism, lower worker’s compensation claims, lower recruitment costs and less turnover. Not to mention, your team will respect you more for caring so much about their health (talk about a public relations in heaven). In order for ergonomics to be effective and profitable, it has to be a part of the culture. A culture is a shared system of values and beliefs. If not everyone believes 100% in maintaining a safe and productive working environment, it simply will not last, which is why Senior Leadership is so important. If you don’t believe me, think back to a time when your brother wanted to do something like go to the park. Because it was his idea, you probably did not want to go. But, 15 minutes later, your dad suggests and you are all in. Why? Because there is an aspect of the leadership presence which makes things happen. Your leaders are leaders for a reason – people follow them. It would be most advantageous for someone at the top to spearhead this effort so that the rest of the team or company knows it is a top concern. Otherwise, you are going to burn yourself out like a dog chasing its tail. Where are you experiencing high task repetition? Where are you experiencing forceful exertions? Are you experiencing any sustained awkward positions? One way to collect data would be to conduct a job analysis where you dedicate someone to carefully observe a worker’s output throughout the day. Sometimes it takes a 3rd party to really see how inefficient or simply unproductive a person’s environment is for them. After data intake, you can then come together with that working group to identify the problems and come up collectively with constructive solutions. It would also be wise to identify what kind of budget you would have for these solutions. Examples of solutions could involve back-supportive chairs, standing desks, hand-friendly mouses, redesigned processes, walking desks, stretching breaks, job rotation, proper body mechanics, etc. Stray away from answers like “revenue growth”, since there are a lot of factors that go into that and focus on other tangible metrics like Recruitment costs, Turnover, Absenteeism, Output, and Morale. This type of reporting should be a part of your monthly meetings or other regular frequency. As this will be a part of your culture, it should be measured and reinforced constantly. Suggest members of your team to rotate as captain each quarter who will drive these Ergo-metrics (yes, I made that up). In conclusion, Ergonomics is vital to the success of your company because a company does not consist of robots, but a group of human beings. And in today’s shifting landscape to an office, rather than a plant, you may think you do not need to worry about this as much. Unfortunately, that is just not the case. Musculoskeletal Disorders are just as present in our workforce and can be potential hazards, if they are not addressed. So, what to do now? Get executive buy-in, ingrain this into your culture, gather intake from your team, implement solutions, and measure your success. I guarantee that at the very least, you will see heightened appreciation from your team for thinking so highly of their well-being.